oil with wax for oiled wooden surfaces made from natural and modified plant oil and resins with matting agents, lead- and cobalt- and terpine free. Care- Wax Oil Maintenance oil with wax for oiled wooden surfaces made from natural and modified plant oil and resins with matting agents, lead- and cobalt- and terpine free. Application: Shake well before use! Surface must be dry, clean and free of dust. use dry cotton cloth or buffering machine. Spray little amount of care wax oil onto surface and spread it in very thin layer using cloth or buffering machine. Let it dry for minimum 8 hours under good air ventilation. Please refear to our care and maintenance guide. 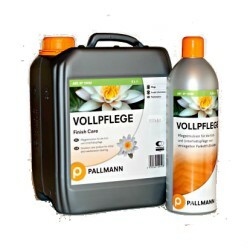 Consumption: 80-120m2 per litre per application, for initial care up to 150m2/litre. Storage: Keep away from children! Shelf life max. 6 month for opened bins. Attention: Soaked clothes or pads must be kept in a closed metal container or washed immediately as they may start burning by self-ignition. * At 20° C and 65 % relative humidity, depending on the type of floor covering and the absorbency of the substrate.